Explore nature’s bounty on your Big Island, Hawaii honeymoon. If you and your future spouse love adventure, then a Big Island, Hawaii honeymoon is right up your alley. This tropical paradise is full of scenic settings — making it a perfect place for a romantic getaway. Station yourselves at one of the island’s beautiful and luxurious resorts in Kona, or step outside of the resort and check out the island’s volcanic craters, pristine beaches, and more. 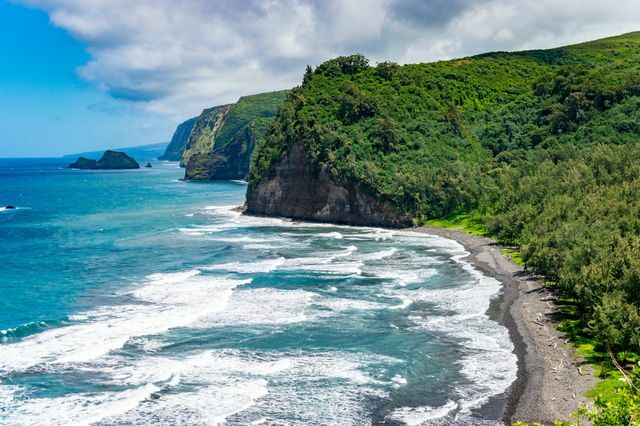 While the beach destination requires a rental car for exploring, a Big Island Hawaii honeymoon is filled with exciting sites to see and places to explore. Start with a trip to Volcano National Park, where a driving tour leads you to encounter volcanic craters, walks through lava tubes, and a spectacular view of active, red lava spilling into the ocean at the end of the road. There’s an epic hike you can take to encounter the lava up-close-and-personal, but an experienced guide and the right supplies are highly recommended to take on that feat. From the rocky surrounds of Pele’s realm, head to the ocean for some epic snorkeling. Great spots include Kahalu’u Beach Park and King Kam beach, where rental equipment is available on site. But for the brave-hearted, a night swim with ocean giants—beautiful winged manta rays—is a must. In search of lush greenery, head to Waipi’o Valley, where the landscape changes drastically to rolling green hills, you may think you’ve wandered onto the set of Lord of the Rings. The island offers plenty more for fun-seekers, including biking, hiking, helicopter tours, and star gazing. When you are in the mood for some R&R, explore the main drag of Ali’I Drive, along the shoreline. You’ll spot snorkelers at the small beach outlets, but you can also grab some great grub along the way, and souvenirs to take home to the family. For an incredible adventure, a Big Island, Hawaii honeymoon is definitely worth considering. You’ll find an escape from the cold almost all year round if you take a Big Island, Hawaii honeymoon. However, when you go really depends on what type of crowd—and budget—you have in mind. December through March and June through August see the most crowd, and resort rates can double. April, May, and September see the least crowds and lowest prices, and temperatures are usually mild with lots of sunshine to enjoy. October and November shoulder the busy season, but have the benefits of perfect weather and fewer crowds for your Big Island, Hawaii honeymoon. Snorkel with giants: Large manta rays live off the coast of Kona, feasting on plankton. Take a night snorkel with these winged beauties through tours like Eka Canoe Adventures. Stargaze on top of the world: You may never find yourself closer to the stars than at the Mauna Kea observatory, 13,803 feet above sea level. Watch the epic sunset, then bundle up in parkas and blankets as you watch the stars come out—such a romantic Big Island, Hawaii honeymoon experience. Tour Mountain Thunder Coffee Plantation: Take a tour to see how coffee is grown and processed—then treat yourself to a tasting. Grab a bite at Da Poke Shack: If you love poke, you’ll be hard-pressed to find a better bowl than what they serve up at this local favorite. Swim with sea turtles at Kahalu’u Beach: Get here early to beat the crowds, but stay for the regular sea turtle visits, where you can swim as close as five feet from them. Enjoy a picnic lunch from the nearby food truck. Step foot on a black sand beach: A visit to Waipi’o Valley should include a stop at the black-sand beach. You can hike or horseback ride to get there. Sunbathe on Hapuna Beach: The island's best beach is full of white powdery sand and warm waters for boogie boarding or a swim—definitely worth a visit on your Big Island, Hawaii honeymoon. Have a seafood dinner at Merriman’s: Located in Waimea, the flagship restaurant serves up authentic local flavors in farm-to-table dining. Visit Akaka Falls State Park: Take in the 420-foot falls after a nice hike through a rainforest filled with fragrant ginger and giant philodendrons. Enjoy the scenery at Queen Liliuokalani Park and Gardens: The ornamental gardens are dedicated to the Japanese immigrants living in Hilo. Sip local brews at Kona Brewing Company: Learn how the popular island brewery makes their beers, and enjoy a sampler while listening to live music in their pub.